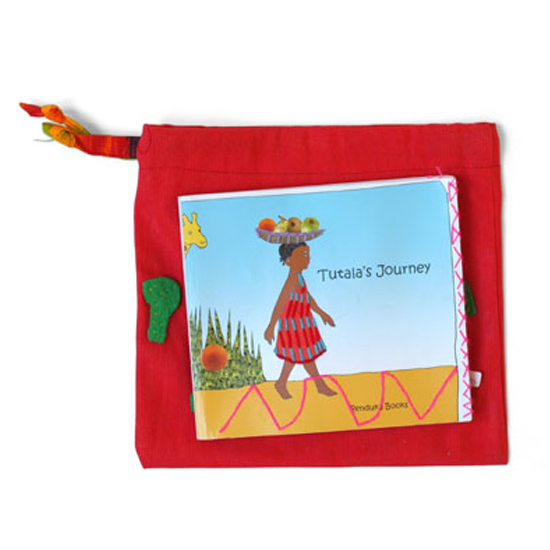 This booklet is the hand embroidered cartoon of Tutula, an Ovambo girl who is walking across Namibia to bring harvested fruit to her family. On her way, she endeavors a little adventure with some of the Namibian animals. This booklet is the hand embroidered cartoon of Tutula, an Ovambo girl who is walking across Namibia to bring harvested fruit to her family. On her way, she endeavors a little adventure with some of Namibia wild animals showing us that, ultimately, life is about giving and being given. This booklet was developed in collaboration with Design Academy Eindhoven and designed by YoungShin Sim. As a student, she visited Penduka, and developed this story together with the Penduka artists. Size 15,5cm x 18cm, bag material: 100% cotton, book material: thick paper.